Dimensions: 400 mm.+ 600 mm. diameter. 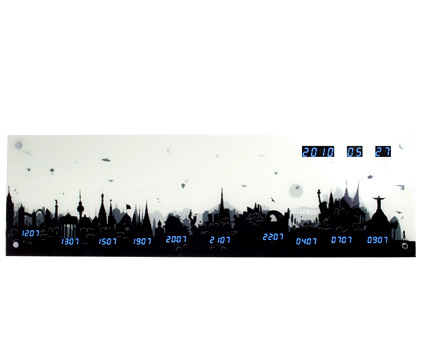 “Skyline” shows a strong image of the skyline of world-cities and their local time. The different cities that show the different time zones are melted together. A small Godzilla was placed into Tokyo as a joke. This was further developed until the clock was filled with all sorts of extra figures and joke’s making it a humorous, lively, global one-world-picture that also tells the time. Look closer …. is that ET flying in the sky?